The new “Big Idea” Service Learning award is a monthly recognition of students, staff, or faculty who make a difference in our community. The first award of the year went to faculty who volunteered at the La Posada men’s shelter. 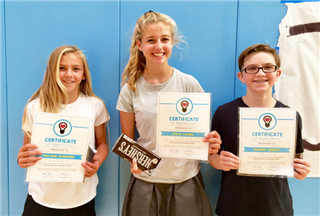 The September award went to these three middle school students, who distinguished themselves by demonstrating extra initiative, patience, and kindness during their first few Service Learning field trips. Gillian works with preschoolers at Head Start, and Jolie and RJ work with senior citizens at ActivCare. These students are doing good, and doing it well!